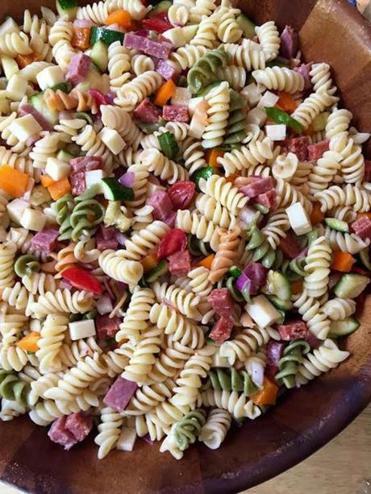 Every picnic and backyard barbecue has its own version of the ubiquitous pasta salad. Often a sorry side smothered in mayo or slicked with oil, it is a dish that just begs for a makeover. Here you have it: a version that incorporates the classic ingredients of an Italian antipasto platter and is dressed lightly with tangy red wine vinaigrette. Extremely hearty and packed with flavor, it takes pasta salad from a supporting to a leading role. 1. In a large pot of boiling salted water, cook the rotini, stirring occasionally, for 7 to 8 minutes or until the pasta is tender but still has some bite. Drain into a colander, rinse with cold water, and transfer to a large bowl. 2. Slice the zucchini lengthwise into ½-inch strips. Drizzle with olive oil, sprinkle with salt and pepper, and grill for 3 to 4 minutes on each side or until grill marks appear. Let cool, then cut into cubes and add to the pasta along with the salami, pepperoni, provolone, bell pepper, and onion. 3. In a medium bowl, combine the vinegar, honey, salt, and pepper. Slowly whisk in olive oil until combined. Pour over the pasta mixture and toss until the salad is well coated. Cover and refrigerate for 1 hour. 4. Remove from refrigerator and let stand at room temperature for 10 minutes. Stir in fresh basil and add additional salt and pepper, if you like. Bethany Graber can be reached at bethany.graber@gmail.com.